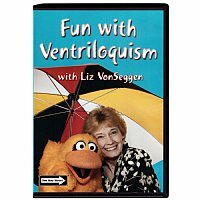 The first of Liz VonSeggen's ventriloquism training programs on DVD format. Liz will take you from A to Z without moving your lips! You'll get step-by-step training in lip control, figure manipulation, and the ventriloquist's alphabet. With practice, you can perfect the hard letters: F, V, M, W, B, and P. Whether you are a beginner or advanced student, the many sub-chapters and bonus features on this DVD make it easy to focus on specific areas for improvement. The companion DVD, "Fun with Character Voices," is also a great resource.